PHUKET: After securing a first win of the season in their last match, the Village were confident of another successful outing against Phuket’s senior cricket league leaders, Patong, who loss in their last match to Jabudays (ICC). With only 3 points separating the top four teams, a win for the Village, last seasonfs runners up, would put them back in contention, whereas a win for Patong would advance them one step closer to securing a finals berth. The Village posted a good score of 193-6 batting first. However, Patong eventually ran out comfortable winners, reaching their target scoring 196-7 in the 28th over. After winning the toss, Patong put the Village into bat. The Village looked very determined to survive the initial 10 overs without loss, with Mark Roberts (25) and Craig Murphy (24) putting on a decent opening stand, until Roberts fell just two balls before drinks with the score on 38. Martin Platts (11) then joined Murphy advancing the scoreboard to 54 runs before he was dismissed. However, Murphy and Martin Foster (32) then put on a useful 46 run partnership before Murphy lost his wicket in the 23rd over. Foster was joined by Danny Taylor (39), who combined for a 48 run partnership to take the score to 148, until Foster was bowled shortly before the 30 over drinks break. Mark Whetton (15) and Mark Ashman (12 not out) also provided valuable contributions to enable the Village to reach their highest innings total this season with 193 runs after 35 overs. Pick of the bowlers for Patong were Kishor Jhagta (0 for 13 from 7 overs) and Dave Watson (2 for 37). After the lunch break, Patong set out to chase down the Village total. However, they got off to a shaky start, losing three early wickets for only 28 runs and the Village had their tails up, hopeful of an upset. However, Patrick Morton (78) and Neil Quail (32) combined for a match winning 94 run partnership before Quail fell shortly before the 20 over drinks break with the score on 122. 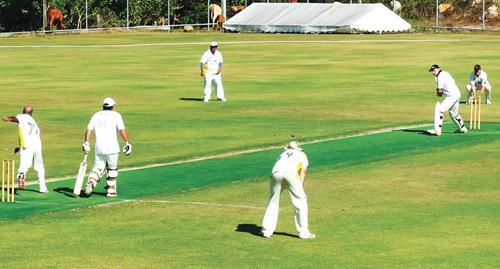 Patong captain, Anthony Van Blerk (15) then joined Morton to advance the score to 151 runs for the loss of five wickets before he was dismissed. The Village desperately needed to take wickets as Patong were speeding along at a run rate of seven runs per over. They eventually claimed the prized scalp of Morton in the 25th over with the score on 171. However, Manish Sadarangani (21 not out) brought Patong home to victory in the 28th over. Pick of the bowlers for the Village were Craig Patterson (3 for 51), Tom Gordon (2 for 31) and Craig Murphy (2 for 45). Patong have now extended their lead at the top of the table. On Sunday, March 24, Patong take on the undefeated Laguna, who, with two matches in hand, will be looking to advance up the table. The second round of Phuket Cricket Groupfs Junior Sawasdee League took place at the Alan Cooke Ground (ACG) on Saturday March 16, with the PCG Youth Academy teams taking on HeadStart International School. In match 1, PCG A (226) played PCG B (200). Kimon and Hue top scored for the PCG A team with 68 runs. For PCG B team, Ryan and Harry top scored with 61 runs. In match 2, HeadStart A (199) played HeadStart B (160). Tin and Josh top scored for HeadStart A team with 74 runs. For the HeadStart B team, Ferry and JH scored 61. In the playoff final, HeadStart A (255) played PCG A (232). PCG A put up a good fight with Harry and Bonnie scoring 67. However, HeadStart A proved too strong with JH and Josh scoring 75. The PCG’s youth academy training sessions take place every Saturday morning at the ACG. All children are welcome. Please contact Phuket Cricket Group chairman Mark Ashman (click here) for further details.